I had no idea what to look for when I purchases my used sail boat. All I had to go by was what I thought looked cool and so I ended up picking a boat mostly based on its looks. Thankfully I had a survey done and the surveyor pointed out a whole list of problematic areas. 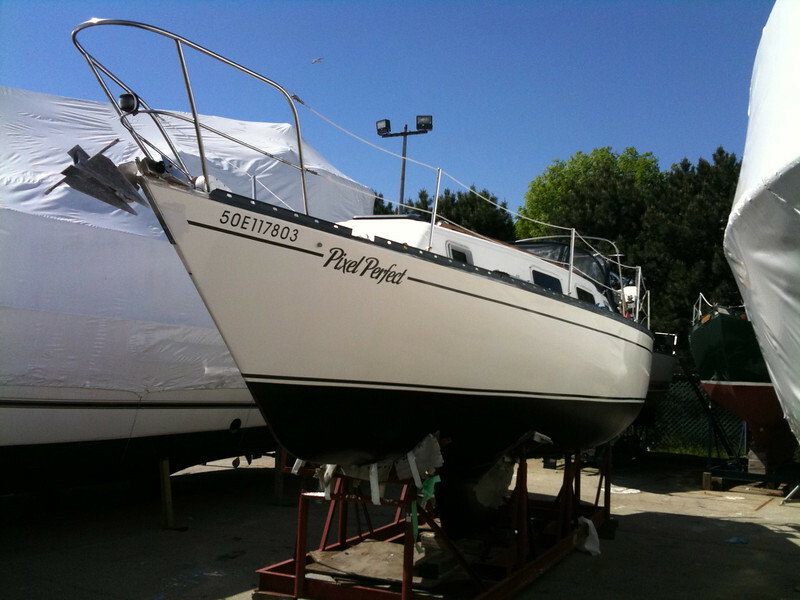 Unfortunately, because of my eagerness to jump into boating and my lack of knowledge about boats in general, I purchased a boat full of problems which ended up being very costly to deal with. After 3 years of fixing these issues, I have looked at every inch of the sailboat in close detail. I have learned a lot and I thought I would share some of my experiences in hopes of helping anyone else buying a used boat. The engine is the heart of the boat. If there is something majorly wrong with the engine, move on and find another boat. The cost and time involved in fixing an engine is simply not worth it. In many cases the cost of hiring a crane and crew to pull out the engine, buy a refurbished engine and re-install it would cost more than the boats entire worth. My sailboat came with a 20 horsepower Yanmar engine. From first glance it was impressive. Starting the engine up was a thrill as the engine came to life quickly and settled at a nice idle. The smoke was minimal and clear. I was happy that it wasn’t puffing black smoke like many other sailboats I had seen maneuvering around the marina. After my broker commented on how great of a condition it looked, I was sold and turned my focus elsewhere to continue my initial inspection. How I wish I had a qualified mechanic to give the engine a once over! What I had not noticed was a crack in the engine water jacket. At some point the previous owner had not properly winterized the engine. As the temperatures dropped, the water in the engine expanded and cracked the outer jacket. I am lucky the engine wasn’t critically damaged in my case. I have tried repairing it with JB weld year after year but water eventually manages to weep through the patch job. The engine mounts were also in terrible condition. Eventually a lag bolt snapped under the vibration causing the engine to knock around terribly alerting me to the issue. In my case, because the mounts were in poor shape, I could not get my engine aligned properly. Any mis-alignment will be noticeable from the cockpit. Try reviving the engine up. If you feel the cockpit vibrating you could have an alignment problem that may be difficult to fix with old aging motor mounts. Before buying a boat, get down there with a flashlight and inspect those motor mounts. A simple glance behind my electrical panel revealed a rats nest of wires. At the time I thought this was standard complicated boat wiring but I soon learned this is not typical and should be fixed. Re-wiring a boat is daunting, and after 3 years I am only just feeling confident where all the wires go and what they do. Trust the surveyors judgement. If its a mess, and your a novice at wiring.. it may be best to move on. I look forward to re-wiring my panel but it may not be your cup of tea. There are many wiring tools to purchase and the cost of marine copper wiring is expensive. If it looks like the previous owner did not care in organising the wires neatly, you can be sure that he overlooked or neglected the safety aspects as well. ABYC standards require certain safety considerations that are above and beyond household wiring. You will not be able to use home depot electrical components on your boat. In my situation, I was living in the boat year round which meant my AC power consumption was higher than usual and I was even more concerned about safety. I noticed in the winter that I would continuously trip the breaker while my heaters ran. I was pretty sure that I wasn’t demanding more than my circuit should handle and after some research I found that I had an undersized breaker in place. For safety I found it was best to setup a ‘pony panel’ to bypass my 30 year old boat wiring and plug my heaters directly into this panel. This gave me peace of mind while I slept, and while I was work. The wiring requirements 30 years ago were a lot less demanding back then, so plan to spend some time and money upgrading your wiring. This is an ongoing project for me but luckily DC wiring is not too complicated and can be achieved if you have the time. It is inevitable that on a 30 year old boat, you are going to find wet core in some places. Sure enough my survey found a number of ‘soggy’ spots which drastically lowered the value of the boat. Again my eagerness to buy the boat made me overlook this issue. If you have the time, keep looking for a boat that doesn’t have moisture issues because this is also another costly repair job. The worst of it for me was in the cockpit floor. I did not realize just how bad the floor was as the previous owner had placed beautiful teak floor grating over the cockpit floor. After a few rainfalls I noticed water had somehow dripped onto the fuel tank below the cockpit, and after more investigation I found the leak by the steering pedestal. I removed the teak grating and was shocked to find the floor very saggy and felt like it was collapsing under my feet. Please take a look at my in depth article on the fiberglass floor repair to get an idea of just how massive of an undertaking this project is. It is not for the faint of heart. It is not overly difficult but it certainly cost me money and a lot of time. I know there are some boats with cored hulls. I have not had much experience with them as my boat had a solid fiberglass hull. I do know the problem with them is the same as with the deck. If moisture should happen to find its way into the core, you have an expensive problem on your hands. The hulls curvature and location underwater makes it very hard to repair and in most cases would cost more than the boats worth. I was willing to spend the time and effort to learn to repair the deck on my own, but if I had wet hull issues, it would have been game over for me. Be sure to get a professional survey of the hull if you go the cored hull route. When you try to get your boat insured (whether its for live-aboard or pleasure) you will find the insurance company will ask about your boat survey. If you had any major issues highlighted, such as what I had just described earlier, you will not be insured until they are fixed. In my case the single most important safety issue was the propane locker. The locker should be airtight with no possibility of propane leaking into the boat. The feed into the boat should continuous with no joints or connections directly up to the appliance. My boat had a propane locker with a massive hole on one side where the propane fed into the boat. Plugging that hole was a major task due to the difficulty of accessing the tight corners. To get insured I had to remove the propane entirely until I could build a brand new propane locker from scratch. I will go more into the specifics and requirements for a propane locker in a future article. You will be surprised how quickly boating supplies add up in cost. When going through the safety checklist, you will need to make sure adequate flares are on board, life jackets, bailing buckets, whistles, waterproof flashlights, carbon monoxide detectors, propane sniffers, the list goes on. You will find yourself at the local boat shop quite often and be continuously tempted. Be careful here. It was very easy for me to blow through a few thousand dollars here. Looking back I wish I had been a little more frugal. Be warned. There are countless other issues you have to watch out for.. sail cloth condition, water damage, steering control mechanism, rigging, battery condition. You will find a growing list of issues that will eventually have to be done. Make a list of that and figure out if you have time to work on them. I say that because paying the yard to do the repairs will quickly add up to cost more than the boat is worth. I hope this will help you get some perspective the next time you are shopping for a boat, and help you from feeling overwhelmed.